It'd be interesting to see what your uncle's Euro-DNA-CALC results are. I ran the same comparison (NWEuro 69; 37-100)(SEEuro 31; 0-63) (Ash 0; 0-7). 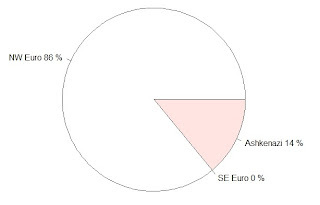 I also have no obvious Ash ancestry, although I do have significant East Euro contribution. 23andMe shows significant self-described Ash, particularly on Chr 11, and I do have several matches with people of Ash descent. I guess I must conclude some possibility of distant Ash ancestry, despite conflicting results. sounds interesting but way over my head. i'm going to tell my sister about it - she's the one who's doing the genealogy in our family. Isn't the likeliest scenario that your father has a single Ashkenazi grandparent? 12.5% would be expected, and that's close to 14. That grandparent could represent a convert or even a so-called non-paternity event. Great detective work. Ive been excited to get the latest sale results from 23andme back (due any day now) I have data from myself and my uncle. Its neat to see what you can do with DNA from multiple family members. Did you ever check your uncle's Euro-DNA-Calc results, which Dieneke was curious about? It means that you have a distant Jewish ancestor. Hi CeCe. I recently took 2 ancestry dna tests after hitting brickwalls on the paper trail. My Mother's family is from Poland and my Father is German, Irish and English that I know of. I took a DNA test through Ancestry.com and it showed my results as British Isles, Eastern European, Scandinavian, Irish. Trace Regions are Central Asia, European Jewish, Caucusus, Iberian Peninsula, Italy/Greece. The thing I am curious about is the Jewish ancestry. The DNA test showed me to be <1% European Jewish....I took another DNA test through FTDNA and it did NOT show any Jewish in my Origins. HOWEVER, when I was looking at my matches on the Chromosome Browser, I only have Jewish matches from Poland and Ukraine on Chromosome 12 and there are many. 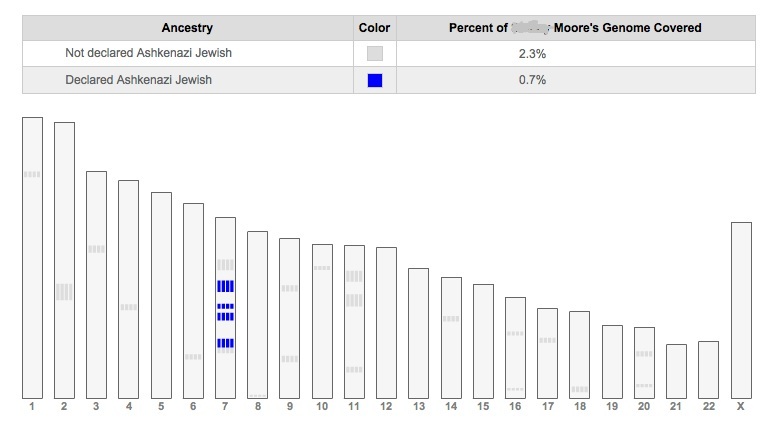 Does this mean I have a possible distant Jewish ancestor? I think its interesting considering that my Mom is Polish. This is a very old post, so quite out of date. 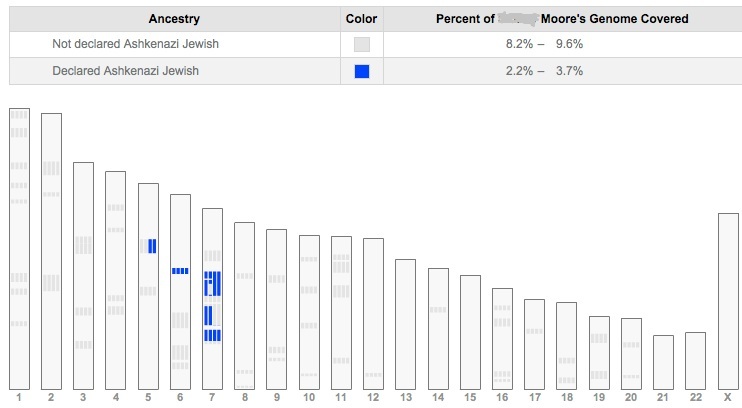 Since this time, 23andMe has gotten very good at predicting small amounts of Jewish ancestry. It certainly sounds to me like you have some distant Jewish ancestry if your matches have all four grandparents of Ashkenazi Jewish ancestry. I have the same cluster of Jewish matches you describe on my Chr. 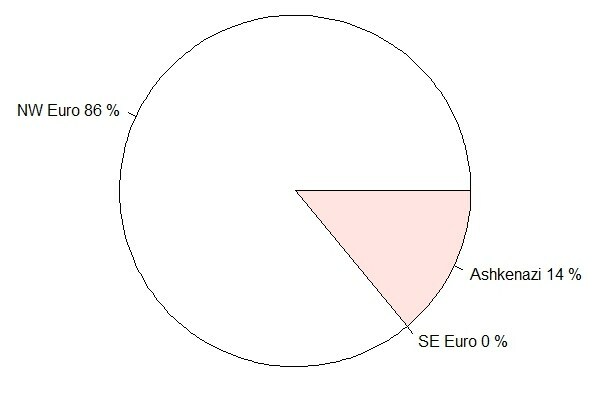 7 and 23andMe shows that portion of my Chromosome Painting as "Ashkenazi". 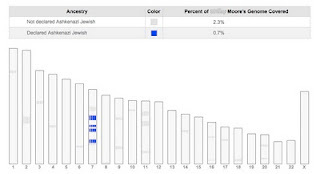 I had my autosomal DNA tested through Family Tree DNA two years ago and according to the more recent My Origins breakdown of my DNA I have no Jewish ancestry. 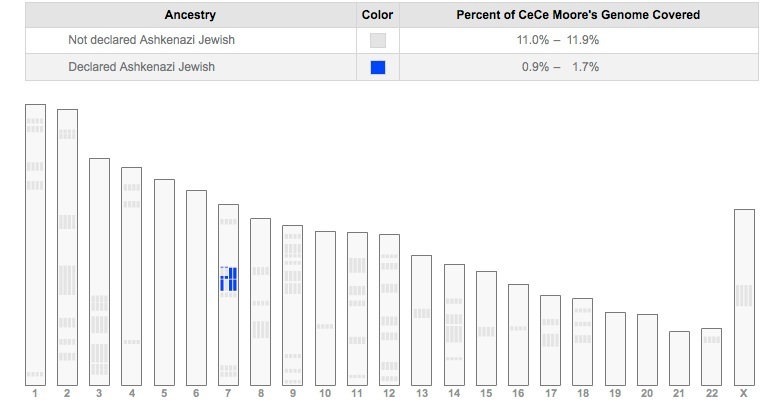 However, I have somewhere around 300 Jewish DNA matches ranging from 5th remote cousin to 2nd-4th cousins. I also have noticed patterns where my Jewish matches appear to match with me. I have an area on chromosome 3, one on chr. 4, one on 12 (the biggest percentage on that one, and some on chromosome 17. Some share segments with me in more than one of these spots. How can I have no Jewish DNA yet share DNA with so many Jewish people? I know of no Jewish ancestors by the way. However, when my maternal grandmother's brother died in '96, his son found a Menorah, the prayer shawl, and armband holding the prayer book, hidden in a box that had been covered in multiple layers of tape under his bed. Not sure what that was about. I only know my grandma and her brothers were raised Lutheran (this great uncle of mine was also a Free Mason) and had one Lutheran parent from Germany and one Mennonite parent born in Nebraska whose Mennonite parents had come from Germany and Russia. My grandmother passed before I found out about the Jewish items her brother had had in his possession so I never could ask her about it. That sounds very intriguing! (Again) This is a very old post, so quite out of date. 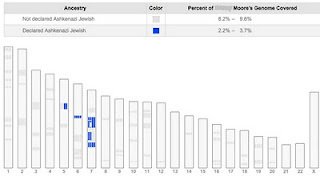 Since this time, 23andMe has gotten very good at predicting small amounts of Jewish ancestry.It certainly sounds to me like you have some distant Jewish ancestry if your matches have all four grandparents of Ashkenazi Jewish ancestry. I have the same cluster of Jewish matches you describe on my Chr. 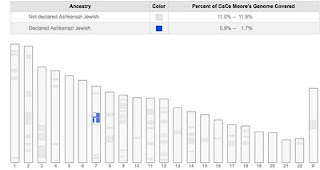 7 and 23andMe shows that portion of my Chromosome Painting as "Ashkenazi". Have you joined the Mennonite DNA Project, by the way?